Balanced precariously high atop an extension ladder with a pair of red Swiss pruning sheers one cold February afternoon, I discovered a pine sapling in my gutter. He was a healthy looking specimen exhibiting a haughty attitude that quite amused me, considering he measured only six inches and was growing in a mix of stagnant water, rotting holly berries, and slimy black leaves. Removing him gently so as to protect his young roots, I transplanted him into a big terra cotta pot and tucked him into a sunny corner of the yard to ride out the rest of the winter. Pinus is what I’ve decided to call him. That’s Latin for pine tree. I know you’re thinking it, so you might as well just go ahead and say it. Rich Barnett is a treehugger. I’m unable to pinpoint how or when it happened. Certainly, I’ve many memories of trees associated with different times and places in my life. Miami will forever remind me of mango trees. As a teenager, I smoked pot behind the cover of a particularly fragrant Southern magnolia. Later on, majestic golden ginkos provided a dramatic backdrop for romance in the Nation’s Capital. Yet, I’ve never actually hugged a tree. Nor have I considered sitting in one for months on end to prevent it from being cut down. At least not yet. What I am, though, is passionate about trees, forests, and wild places. I believe in their power to inspire and restore one’s spirit. I also understand the important role trees play in things like removing air pollutants and helping to purify water, sequester atmospheric carbon, and maintain biodiversity. In Rehoboth, it’s the tall, studly Loblolly Pines that catch my eye. Reaching heights of 100 feet and growing as big as three feet around, they’re truly noblemen, descendents from the largest single-species forest ecosystem in the world that once covered ninety million acres stretching from south Jersey down to the Florida Panhandle and west to Texas. These tall timbers defined the Southern landscape until they were for the most part clearcut by timber companies in what some historians have called a natural resource holocaust of ignorance, greed, and desperation between 1880 and 1920. Several other varieties of pines grow in Rehoboth. There’s the Eastern or Northern White Pine, the Pitch Pine, the Shorfleaf Pine (aka the Yellow or Arkansas Pine), and the aristocratic sounding Virginia Pine (behind whose back is often called scrub pine or Jersey Pine). I’m by no means the only one who has succumbed to the allure of the big pinus in Rehoboth. Up until the 50’s, city officials regularly touted the fragrant pines and splendid bathing beaches as key resort assets. You can see what I mean in the following two quotes that I’ve lifted from pre-WWII tourist brochures. Rehoboth is fanned alternately by the invigorating breezes from the Atlantic Ocean and the health laden ozone from its fragrant pine groves. It is truly a resort with the greatest natural attractions. Nature in her most versatile mood planned Rehoboth. Here romantic paths winding through pungent pine groves usually found only at inland resorts, entice one on to the sandy white bathing shore and briny sure of the great Atlantic Ocean. Here is to be found a fund of health, richness of beauty and pleasures incomparable. Stately and sweet smelling pines are here in all their majesty, grouped here and there and partly surround the entire resort. It is truly the only seashore resort on the American coast where the stately pines and the ocean waves meet and greet each other vie in each others splendor. 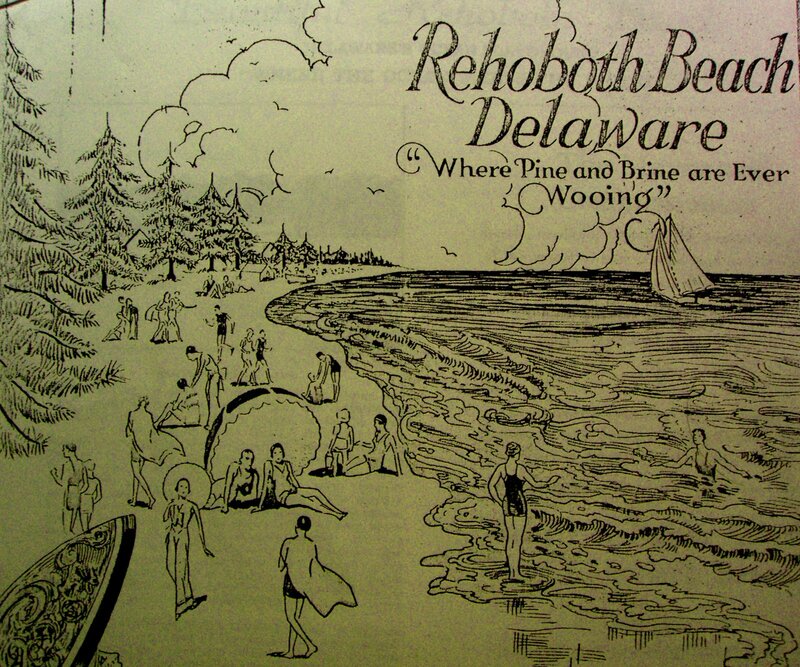 Rehoboth has long been proud of its trees, and, in this regard, just a few years ago became the first municipality in the State of Delaware to enact an ordinance to protect trees on private property – an indicator that trees are still important to the future of Rehoboth. Alas, not everyone views this with as much enthusiasm as I do. Certain city commissioners have begun to chop away at it. Probably because the real estate developers don’t like it. The residents of Rehoboth, however, like it. In three surveys over the past five years, they’ve identified tree preservation as a key priority. As someone who works for an environmental group and who has watched the Bush Administration dismantle America’s environmental legislation a little here and a little there, all in the name of easing regulations and burdens, I’m envisioning the same fate for our tree ordinance. Death by a thousand cuts. So, in closing, I want to encourage all of you with treehugger tendencies to join me in keeping an eye on the goings on at City Hall. It’d be a shame to lose our big trees, our history and our heritage, just for the sake of convenience. Oh, and one last thing. In case you’re wondering, young Pinus is adapting quite well to his new domesticity at the home of this treehugger.